For over three decades Nikon users have had the option of a uniquely versatile lens. The first 200-400mm f/4 was introduced in 1983 but as a manual focus model offered to NPS members initially it failed to capture the imagination of the wider public. It was not until the lens was totally redesigned and offered as an AF model with image stabilization that the lens started to attract attention. Indeed, it was to become one of the most popular of the super-telephoto models in the firm’s line up, so much so that Canon has since launched it’s own version. Upgraded in 2010, this iteration adds VR II and Nano Crystal Coat to the existing construction of 24 elements in 17 groups (with four ED glass elements), focuses to 2m (1.95m in manual) and weighs in at a quite hefty 3.36kg (7.4lbs). 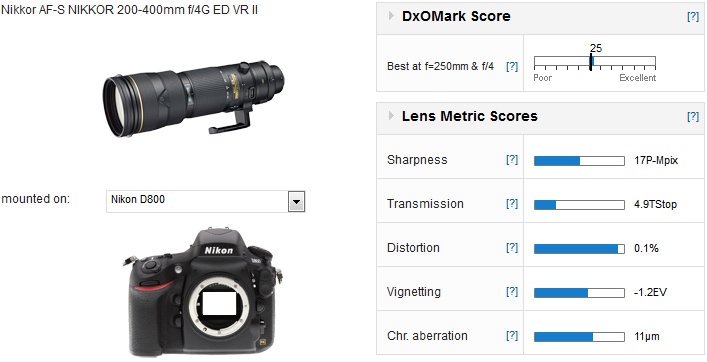 As one would hope for a lens costing a cool $7,000, the AF-S Nikkor 200-400mm f/4G ED VR II performs well, achieving an overall DxOMark Score of 25. Sharpness isn’t up to the fixed focal length equivalents (which vary from 28-25P-Mpix over the same range) but it has very good sharpness across the frame at full aperture throughout the zoom range, though peak performance is at 250mm f/4. Transmission is quite a bit lower than the stated maximum and chromatic aberration while low isn’t quite at the same level as the primes but in all other respects the lens is consistent with those models. 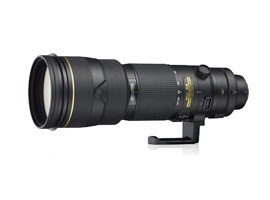 Viewed alongside its main rival the recently introduced Canon EF 200-400mm f/4L IS USM Extender 1.4x the older Nikon lens can’t quite match it optically, although the older lens achieves a slightly higher DxOMark Score overall. 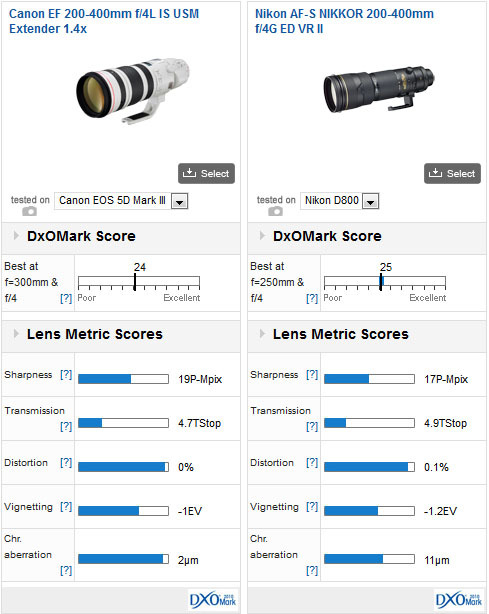 Both are excellent and closely match each other (and high-end 70-200mm f/2.8 lenses).The reason for the higher overall score can be attributed to the camera used for test as we take into account the noise levels and dynamic range of the camera used for the measurements. 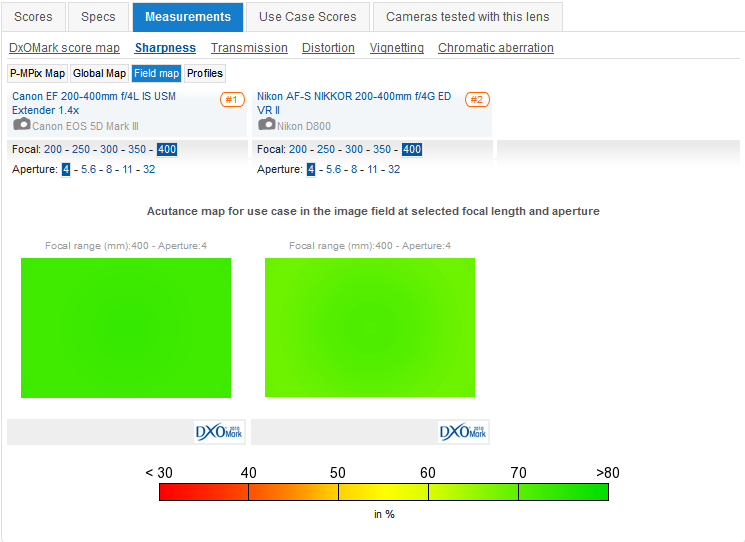 Individual lens metrics provide a clearer indication of the lens performance. While the Nikon lens is a superb performer, the Canon is more consistent in sharpness throughout the zoom range, is slightly ‘faster’, and has lower levels of vignetting and chromatic aberration. Indeed at two microns the Canon zoom has virtually negligible Chromatic Aberration and even the Nikon at 11 microns is quite something given the complexity of a zoom like this. While Nikon users maybe slightly put out by the stellar image quality of the Canon model, the Nikkor lens is certainly no slouch. Given the latest iteration didn’t have any change to the optical cell (other than the Nano Coat) over the 2005 version, it’s a still a convincing performance eight years on. It’s also relatively more affordable. While not cheap exactly, the Canon model is an eye-watering $11,799.